Chris Campion began training in the martial arts at eleven, when an Okinawan karate studio opened near his home. With the encouragement of mentors both “on the mats” and behind the typewriter, he has recently completed his debut novel The Jiu-Jitsu Bum (Northampton House, August 2013). He’s also published short fiction through Fiction365.com and East Meets West: American Writers Journal. I recently had a chance to catch up with Chris and get his thoughts on martial arts, life after publication, and Alec Baldwin. Travis Nicholson: So, the big topic first. Tell us about your book. Christopher Campion: It’s about redemption and second chances set amidst the seedier side of Scranton PA and its characters. I guess you could say it’s slightly noir. The protagonist has to fight not only himself but the world, which always seems to be against him. Practicing Jiu-Jitsu helps him come to accept his lot in life, which changes him mentally, physically, and even spiritually. Like anything in life, nothing is gained without losing something in the process. There are no clean new beginnings. TN: How has your own experience with the martial arts helped shape your work? Any experiences in a tournament or training you’d like to share? CC: I practically grew up in a dojo, so martial arts and budo tenets were chiseled into my little brain. I’d like to credit my karate sensei of many years for that. He was not only my sensei but a real mentor whose advice kept me on the straight and narrow. Later in life, when I’d slip from time to time, I’d hear his voice in my head, and it’d get the wheels back on track. I guess that lasting effect is something I wanted to incorporate with my main character and the novel’s plot. I also wanted to inject some real life situations and people I’ve met through years of sweating on the mats. 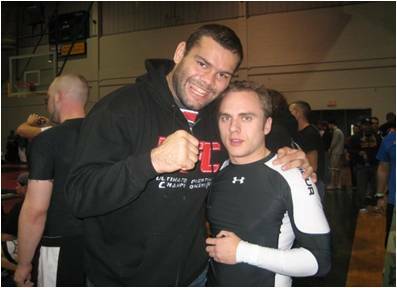 I did a couple Jiu-Jitsu/grappling tournaments, mostly in New Jersey. I didn’t do particularly well, but it was great experience. I remember this one guy caught me in a neck crank, and I literally heard my neck slowly pop a few times like popcorn. Another Brazilian guy cut my face open with his gi as he went for a choke. Things like that I put in the book. Other than the possibility of nasty injuries, it’s a real rush. You feel so alive after you compete that you never really want to come down from it. It’s certainly one of the best ways to see what you’re made of. Because of that, I knew I had to have a tournament scene in the novel. TN: What’s next for Chris Campion? Working on anything new these days? Publicizing The Jiu-Jitsu Bum, maybe? What’s your strategy with Northampton House to get it in readers’ hands? CC: Well, I’m always reading to build my vocab and overall familiarity with literature and the craft. I’ve been working on a couple short stories that I’d like to submit to competitions and journals. I’ve also been plotting a new novel, but I’m really taking my time on that. In fact, there might even be two or more novels in the making. I’ve got to sort everything out and see what I’ve got to work with. I want my next one to be a hundred times better than the last. I want it to have more of my own thoughts, experiences, and personal philosophies on the world. And of course, I want it to be well-written and have a page-turning plot. As for my marketing strategy, I watch Alec Baldwin’s Glengarry Glen Ross “art of selling” speech then cold call random names from the phone book. Just kidding. I’ve been trying to get the word out about The Jiu-Jitsu Bum anyway I can through Facebook, Twitter, Goodreads, LinkedIn, interviews, guest blogging, and hitting up anyone who’d be potentially interested in the book. It’s draining, but it must be done. It’s kind of nice stepping away from the seriousness of writing and learning a little bit about promoting something. I’m also in the process of trying to get in on more local readings. They’re always fun to do. But as I told another writer, I think the best way (so far) to get the word out is by simply telling people face to face about it, especially avid readers. Nothing seems to beat word of mouth. I’ve honestly gotten the most sales that way. But that’s just me. I don’t think ANYONE truly knows the best way to sell. You just have to get it out there and see what works. TN: About six months ago you had an article about confidence published by The Write Life. Anything you want to add now that your novel is out there in the hands of strangers? TN: Here’s a fun one: Who would you cast in the movie version of your novel? CC: George Clooney as Evan. Elisabeth Shue as Cindy (Evan’s wife). Jack, the oldest son, would be John Cena and the youngest son, Tim, would be played by Russell Brand. Victor, the sensei, would have to be Bas Rutten* – no doubt. Samuel L. Jacksonas Tyrone. Ginger, the street vixen, would have to be Charlize Theron. And I’d cast Anne Ramseyfrom Throw Momma From The Train as Sherry (Evan’s mother) but she died a few years back, unfortunately. TN: How did the Wilkes Low-Residency Creative Writing Program help you accomplish your goal of publication? CC: Wilkes and everyone involved taught me (both directly and indirectly) everything. Coming into the program, I had so many holes in my writing ability; I was so naïve about the publishing industry; and I was especially naïve on how hard I’d have to work to create something worth publishing. But Wilkes changed all that. It exposed me to so many authors and perspectives on literature that I was simply oblivious to. It taught me to trust my visceral instinct when it came to feeling a story coming on. Plus, my cohort, The Mobies, was just awesome because we were all serious but could laugh at one another too. I wouldn’t change meeting them for the world. And I have to give mad props to my mentor David Poyer who took me under his dragon-like wing and made me think like a serious novelist. I could have never imagined learning so much from him and accomplishing the things I did from his constant encouragement and corrections. So when it came time to publish with him (at Northampton House Press), I was already in a serious mindset and had no problem meeting deadlines and getting things as flawless as possible. Plus, David always gave me the confidence to write like myself. From day one, David treated me very seriously and the time with him was intense (to say the least) but he taught me how to fearlessly stand on my own two feet and to become a dedicated and professional writer. In all, I don’t think I could have learned everything I did, immersed myself in the writing life, and had that kind of personal attention anywhere else than Wilkes. It’s just an awesome program. TN: Any final thoughts you’d like to share with your potential readers? If you’re looking for a book that has some literary elements but some heavy/noir moments along with nasty fight scenes, then I think The Jiu-Jitsu Bum will be right up your alley. I’m toying with a sequel and I’m also outlining (slowly) two other novels. I’m always plotting a short story or two. There are so many sides to me besides the martial arts in terms of views on the world and personal philosophy and I’m really looking forward to incorporating that sort of thing in my future works, whether they are martial-arts themed or not. I think every writer secretly wants to achieve that. In closing, I’d like to thank The Write Life for this enjoyable interview. Wilkes has always been there for me and the teachers, staff, and students are extremely exceptional people. I could never have achieved the things I have without them.